Picture the scenario. It’s been a tough day. Work was hectic, someone stole your pork pie lunch from the communal fridge and the commute home on the TTC doesn’t go as planned. Where can you go, where there’s various locations and you’ll always get a decent curry? Glad you asked. Bombay Bhel! 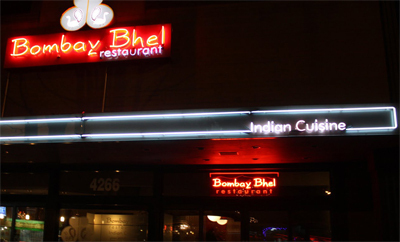 I go there a LOT, and it’s one of the best curries for me personally. Two clues to back up that bold, totally biased statement: (1) They spend money on paying the best chefs and not on their website design, and (2) there’s always a lot of Indian customers enjoying the food … not just pasty-white Brits like me sitting alone and looking around trying to pretend I do have mates, but they’re busy that night. So — onto the food. First off, let me tell you that if you’re looking for the “English style” curry — all the oranges and reds floating around in copious amounts of ghee — then this is not the place for you. Bombay Bhel has opted for the more traditional type of curry: more browns, slightly thicker in texture and with more spice. As someone who started off my curry adventure as a teen on Chicken Korma and worked up to a Vindaloo, asking for “slightly hotter than medium please, old chap!” once had me taking cooling air breaths in between mouthfuls — it was pretty spicy. But DELISH! Another great thing about Bombay Bhel is they don’t scrimp on the portion sizes. I usually have enough of my main course to take half home for lunch next day, but prefer not to put temptation in the way of the pork pie thief at work … so I eat the lot. I’m also a greedy bugger too, so that helps. So, there you have it. 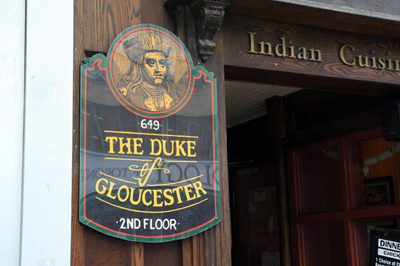 One of my personal favourite curry houses and I give it a nose-blowing, brow-mopping, eye-watering Brits in Toronto 5/5 stars. 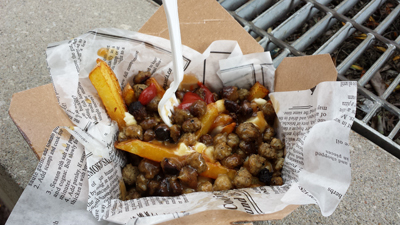 This entry was posted in Uncategorized and tagged bombay bhel, brits in toronto on October 31, 2013 by britsintoronto. So, in effect we’re copying their idea. Fiddlesticks! Toronto wasn’t so much of a choice for me; my parents moved to Toronto when I was 17. I was still living in Europe and decided to stay there and go to university in England. Because I was a minor at the time, I was given permanent Canadian residency along with the rest of my family. At university I met Kieran, who was convinced we should take the opportunity of my residency and move to Canada when I’d finished my studies. Once there, I could sponsor him and he could get residency too. We planned to move permanently … although recently have been talking about looking at other cities in Canada because job opportunities may be better elsewhere. When we both first moved here in April 2011 I was fresh out of university and knew that it was a bad time to be a recent graduate looking for a job. Kieran and I both worked for six months at my parents’ fishing lodge in northern Ontario. It was bliss, totally remote and peaceful. 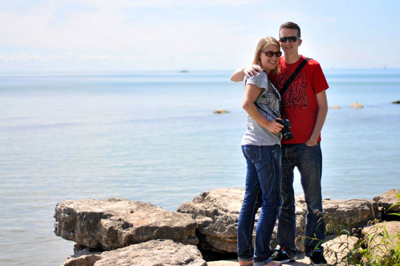 After we finished for the summer we were both still scared to move to Toronto and look for work. We went travelling round south east Asia for two months instead! When we came back we jumped right in and I was lucky enough to get an interview with a Canadian who grew up in Bali. We spent the whole interview talking about my recent trip and she gave me a call the next day with a job offer. Kieran was not so lucky. It took him the best part of a year temping, and looking for work before he found his current job. From a job-hunting perspective we both have had struggles with agencies, and find them beyond frustrating. I moved to another company recently and it took me four months of searching and interviewing before landing a job that I can truly say I love. Every industry here seems very competitive and it can be difficult to get an interview. That being said, Toronto is a wonderful place to live in. We live in midtown, by Forest hill, and as neither of us have lived in a big city before, we are still struck by how much we love being close to the subway, having a grocery store next to our building, and the speed of which we can get anywhere in the city. We also love the constant stream of events and activities we can enjoy living in the city. Toronto has a thriving music scene, many quirky bars and tons of beautiful parks to explore. There are activities for everyone in both winter and summer, and Toronto is close enough to mountains for winter sports, and lakes for summer ones. Really there is no excuse to not be outdoors, and we both really enjoy that aspect. When we first arrived we went on Meetup.com and found the Brit Meetup to be a fantastic place to make new friends. 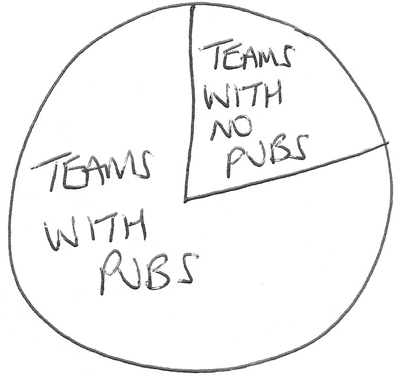 We participate in their bi-monthly pub quiz when we can, and really enjoy it. In terms of pubs I would say Scallywags at St Clair and Yonge always has a British crowd as well as the Football Factory on Bathurst. My advice for anyone moving to Toronto is to get out there and experience all that the city and surrounding areas has to offer. The scenery north of Toronto is breathtaking and in any season you can find something to do. Don’t be afraid to explore all of Toronto’s neighborhoods too as they really are so diverse, and look out for street parties and festivals like Taste of the Danforth or Salsa on St Clair. Thank you K&K! Here’s their Twitter account if you’d like to connect. 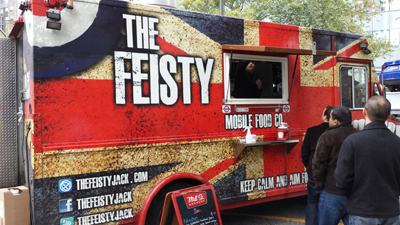 This entry was posted in Uncategorized and tagged brits in toronto, k&k adventures, successful brits in toronto on October 27, 2013 by britsintoronto. Having already won one award since launching — voted Best New Website 2013 by my mum — it would be most pleasing to scoop another. 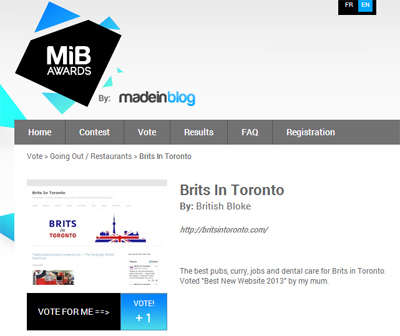 This entry was posted in Uncategorized and tagged brits in toronto, made in blog, mib awards on October 26, 2013 by britsintoronto. That’s why Jane still has many fans to this day — a true Brit who spoke her mind and … was also a massive dance fan! So, Brits in Toronto was very excited to hear about Jane Austen Dancing, a website listing sociable events in and around Toronto based on the theme of the famed, curly brown ringlet-haired novelist always staring off into the distance as she ponders her next best-selling book on the wry foibles of high society, cakes and piano lessons by the window. 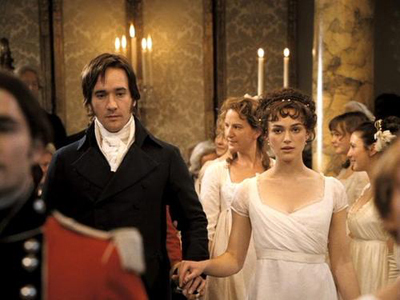 The website lists a lot of Austen- and Regency era-related events and other fun stuff that would even make Jane crack a smile. Here’s the next one: Saturday, October 19 — Trafalgar Ball. Dancing, decorations, live music and toasts to Lord Nelson and King George! There’s also a mailing list, Twitter accounts to follow and a whole lot more. So, swallow your pride, forget your prejudice, use your sensibility and spend some of those cents (that one didn’t quite work) on tickets! This entry was posted in Uncategorized and tagged brits in toronto, jane austen dancing on October 17, 2013 by britsintoronto.